A good, safe, clean with great staff hostel 👍 ! 5 minutes away from metro station 🚉 which will take you all over the city at a reasonable price! I would recommend a stay here ! 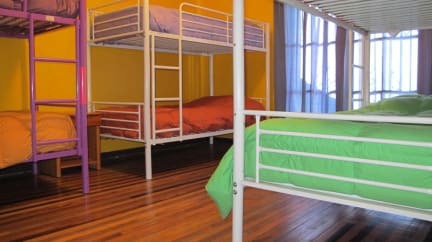 Best hostel in Santiago! Not the big city (party) hostel, but just a nice cosy atmosphere with everyone hanging out in the courtyard. Located in a nice neighborhood with bars and restaurants. Private room - big, comfortable room with bathroom. Owner and staff were helpful and welcoming. Breakfast was coffee/tea, bread, butter, jams, cheese, salami and eggs. Great place. I never write reviews, but this hostel deserves one. Such an accommodating staff and owner here, super clean/organized, great location, and awesome pool. The owner went out of his way to have breakfast for me at 6am on a morning that i had to catch a flight. That sort of hospitality goes a long way. For the most part this place is awesome! I really enjoyed the breakfast mornings, cozy and homey as the rest of the place. Pool didn’t seem too clean which was a shame. Beds was good, rooms big, cute balcony, area is very nice - liked not being in the center of all. However it changed a bit when checking out; my first payment didn’t work, it felt very uncomfortable and accusing when Ivan confronted me with it. He didn’t trust me that a new payment (that worked!) had already been sent. 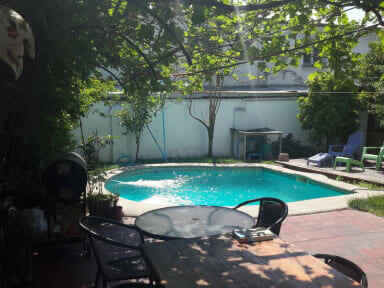 Great location in Barrio Italia. Calm hostel and friendly vibe. No breakfast one morning and showers are lukewarm. Not many outlets. Hostel is super old and run down and abit far from the night life. The breakfast is very basic. The atmosphere is nice and the owner was friendly.